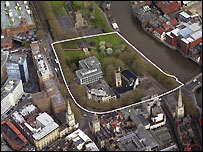 Building work at St Mary le Port in Bristol will have a "minimal impact" on the nearby Castle Park which had been under threat, a councillor has said. Earlier in the year protests took place at the park to try to persuade councillors to turn the plans down. Following consultations a revised plan for the work is to be drawn-up. A campaigner said the council had been surprised by the extent of feeling. "The whole plan should be thrown out and started again," she said. Historian and author Barb Drummond who has been leading the Save Castle Park campaign added: "It's a good that we've got some sort of result but the council needs to look hard at how the city is developed and the understand the importance of public green spaces." Developers Deeley Freed said it recognised there still was "considerable concern" about the loss of green space at Castle Park. "Our aim is still to provide a vibrant mixed use development featuring food retail, improve connections between Broadmead, the Old City and Redcliffe, enhance the setting of St Mary le Port church and provide benefits to the area," a spokesman for the company said.